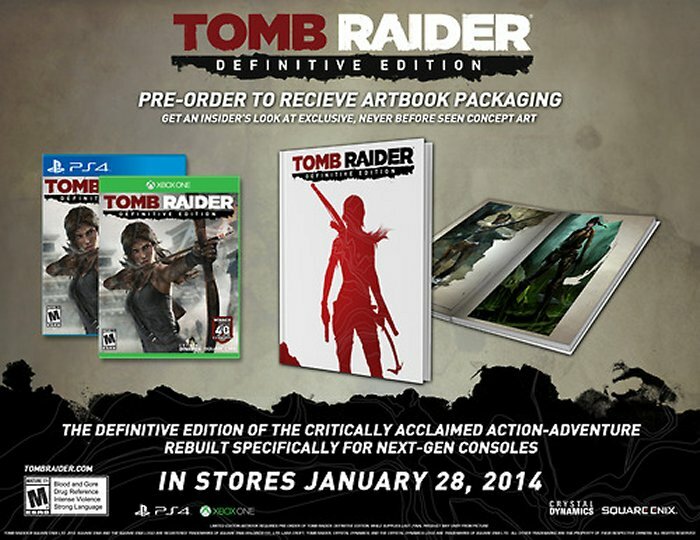 Remember the rebooted Tomb Raider game from earlier this year? It was available on PC, the PS3 and Xbox 360. We had no idea if it would arrive on next gen consoles. Well, good news. It has been confirmed for both the PS4 and the XBone. We had heard rumors about the game appearing on the new consoles last month, when Amazon Italy accidentally posted a listing for the game as a “Definitive Edition”. Now it is confirmed. The title will be available for both consoles in North America and Europe on January 28th and 31st. If you enjoyed the game, you will no doubt want to see what the new consoles offer. There are better graphics of course and Lara’s face looks nicer. You will also get The Tomb of the Lost Adventurer, Dark Horse digital comic book “Tomb Raider: The Beginning,” Brady Games digital art book “Tomb Raider: The Art of Survival,” and “The Final Hours of Tomb Raider” documentary series. There are also a few multiplayer add-ons like four additional characters, six weapons and eight DLC maps. How about six extra outfits? On the PS4, the controller will light up when the torch is used, and Xbox One gamers can use Kinect voice controls for controlling menus and weapon modding. Sounds pretty good.